If you like that mirror polish finish on your edge tools, a strop is what you need. Most people think of strops as what barbers use to keep their straight razors sharp, but a strop is equally well suited to other edge tools. Carving chisels are often honed on a strop because that mirror finish and fine edge will make them easier to push by hand and will give the carver more control. 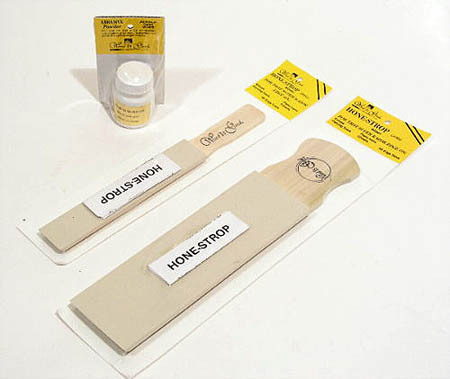 Traditional strops are made from leather. We also sell strops made from a synthetic material that some people believe is actually superior to leather because it is less pliable and thereby will not compress as much. When the strop material compresses it can cause rounding of the edge and can actually dull the tool. Others prefer the traditional leather strops. Fitted with a poplar handle. On both the large and the small strop the sides and bottom are intended to be used for carving chisels. One side is rounded, one side is square, and the bottom is 45 degree.